On 24 October 2008, the anniversary of the entry into force of the United Nations Charter was celebrated. 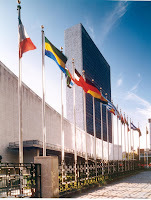 Since 1948 this event has been known as United Nations Day. It has traditionally been marked throughout the world by meetings, discussions and exhibits on the achievements and goals of the Organization. At the UN Headquarters an international concert was held in the General Assembly Hall.